The Basler Fasnacht is the biggest Parade in Switzerland. It starts on the Monday after Ash Wednesday at precisely 4:00 am with the Morgestraich. The carnival lasts for exactly 72 hours and, therefore, ends on Thursday morning at 4:00 am. During this time the Fasnächtler (the participants) dominate the old town of central Basel, running free in the streets and restaurants. 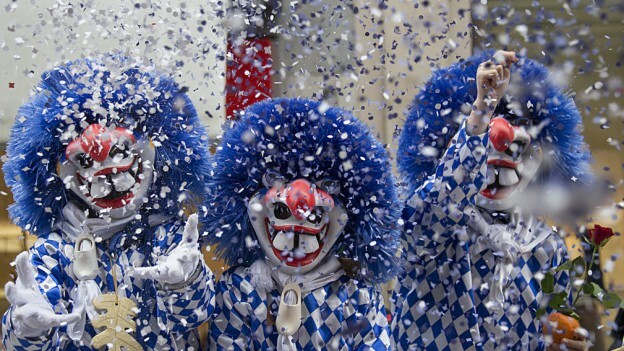 Basler Fasnacht is often referred to as die drey scheenschte Dääg (“the three most beautiful days”). 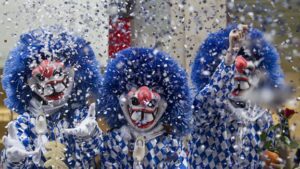 Morgestraich on 19.02.2018 is the first parade of the Basel fasnacht parades and is an incredible experiance for the whole family. All the street lights go out dead on 4am and the pipes and drums start up and the lanterns and the people of all the different Basel Cliques (clubs) start marching around the town. Cortége The parades taking place on Monday 19.02 from 14.00 and Wednesday afternoon 21.02 from 15.00 till close around 10pm are called Cortège and follow two defined ring routes: the inner ring runs clockwise, and the outer ring runs counterclockwise. The two routes are sometimes referred to as the blue and the red route because of their colour representation on the route map. Be prepared to be covered in confetti as the waggi’s (the costumes and masks they were on the floats) and they also hand out candy and other treats to the spectators. Tuesday afternoon 20.02.2018 is kids and family parade is held on the Tuesday afternoon and is a scaled down version for the kids so they get to parade around in the same style as the adults in thier own mini versions. Tuesday 20.02 night is Gugge music night. Marching brass bands playing Guggenmusik are another formation present during Carnival. Although the Guggemusik groups do not participate on Morgestreich, they march and play throughout Fasnacht, starting with the Cortège on Monday, and are showcased on Tuesday night when they perform in Guggekoncerts in various locations, Mainly Marktplatz and Barfusselplatz. The lantern exhibition which are on display from Monday evening until Wednesday morning on the Münsterplatz (the square in front of the Basel Münster) and are lit in the evenings. The lantern exhibition is referred to as the largest open-air art exhibition of the world. Stroll Sunday On either one of the three Sundays directly following the Fasnacht (known as the Bummelsonntage, or “stroll Sundays“), all Cliques and Guggenmusik groups participate in the final act of the Fasnacht. During their chosen day (1st, 2nd, or 3rd Bummelsonntag, depending on the group), the groups go on a small trip somewhere outside of Basel, usually including a visit to a restaurant. Later in the evening, the groups return to Basel in normal street clothes (no costumes or masks) and parade one last time through the inner city, particularly along the major street in the city, Freie Strasse. What to expect on these days. Lots of confetti all over the streets late at night then as if by magic it all dissapears by morning. Large amounts of tourists in the city, as word has spread the tourists flock in as well over 1 million people are expected to see the 3 day festival. Music played loud in a different style, especially at the Gugge music concerts. Lots of lanterns and people having fun. Get ready for a wild 3 days !